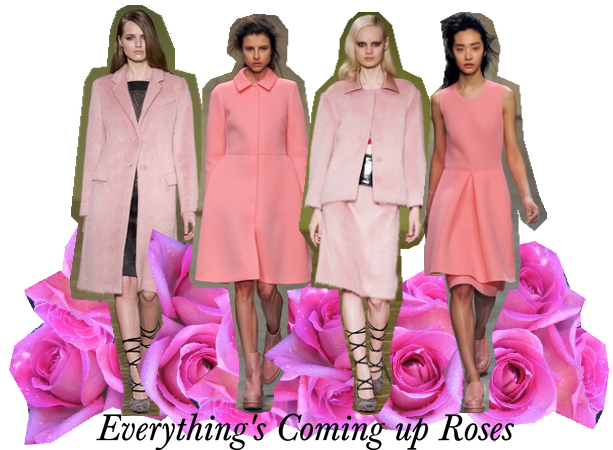 Winter is the time to wrap up in roses! It goes without saying that when it comes to clothes there is a different colour pallet for the different seasons, we learn this from a very young age with our school uniform. In the cold winter months we’re in grey jumpers and navy skirts with itchy dark socks pulled up to our knees, the summer is a different story with striped cotton dresses in more seasonal hues. Even after we graduate from the torment of having to wear ungainly school uniforms we subconsciously adopt a way of thinking about how we dress from season to season. Even now in the summer I might opt for a white sundress or a bright pink camisole top whereas in the winter I lean more towards the darker end of the colour spectrum. Winter is all about burgundies, blacks, greys and navy colours. There are a number of very logical reasons why we humans, in general, dress in this way, it’s in tune with the changing of the seasons, it’s a psychological thing and it’s also practical; dark clothes insulate heat and light clothes reflect it, makes sense, right? But this year see’s the fashion world throw a bit of a curve ball when it comes to our transitional colour palate as one of the biggest colours of season is…Pink! Yes pink, in all its interesting and glorious forms from dark berry to sorbet shades and candy hues, pink is everywhere you look. On the catwalk everyone from Topshop Unique to Roksanda Ilincic and Simone Rocha sent their models down the runway in variations on this rosy theme. This emergence of feminine colours has been met with open arms as it’s a brilliant transitional colour from fall into winter and heralds a return of a real sense of femininity back into fashion. If you’re interested in playing around with pink this season then we’ve put together a little list of some of our favourite rosy items to get your mitts on! 1. Coach Colourblock Molded Felt Fedora - £180 – Make a statement this winter with this cool Coach colour block fedora, a pink hat is one of the easiest way to work the trend into your repertoire. Wear this with a dark ensemble so that the colour really packs a punch. 2. Alexander McQueen Skull Print Scarf - £180 – Alexander McQueen scarves are truly iconic items and well worth investing in, this pink style is perfect all year round, wear yours draped round the collar of your favourite leather jacket to add some colour to an otherwise tough look. 3. L’Oreal Colour Riche Lipstick - £3.87 – With the winter comes winter skin, long gone are the days where you sported a hearty tan, bring some colour to paler pallor with a bright pop of pink lipstick; a really easy way to tie in the colour into an outfit without going overboard. 4. Ted Baker Safuyah Full skirt trench coat - £215 – A trench coat is a perennial staple and good investment piece, give a modern twist to a classic design with this feminine Ted Baker design. When choosing winter coats bold colour usually looks great but with pink we recommend opting for a more muted tone to avoid looking like an extra from The Only Way is Essex. 5. Charlotte Olympia Kitty Cat-Embroidered slipper - £470 – Give ballet flats a new season update with these amazing whimsical kitty slippers from Charlotte Olympia, these pumps are a great day to evening style as their fun nature will get everyone talking. 6. Carven Petal Hem crushed wool mini Skirt - £190 – This summer skirts have been the hero item of every wardrobe with innovative new asymmetric styles and cut outs creating beautiful and modern aesthetics. This pretty Carven skirt is a perfect style for the fall as it will keep you warm as the temperature falls. 7. Ted Baker Jamun T-clasp maxi Clutch - £110 – A statement clutch is a real must have whatever the season, the perfect bag for a night out and an easy way to work the colour into your everyday outfits. This Ted Baker style is a classic; if you’re feeling a little more adventurous why not opt for something transparent for a really cool modern look. 8. Equipment Signature Shirt in Magenta - £225 – Equipment are the definitive word in impeccably tailored every-day shirts and they come in a huge array of colours and directional prints. No wardrobe is complete without the perfect silk shirt and this one is a pitch perfect colour for the season but you can definitely find a more budget friendly version anywhere on the high-street! 9. Kenzo logo dark blue wool knit sweater - £200 – We love anything Kenzo and their new season knitwear is just one example of why, with amazing prints, beautiful colours and cool embellishments we just can’t get enough. This cool logo sweater is a great way to work pink into an outfit, especially if you’re not really the kind of girl who wears a lot of pink. 10. Topshop Strap Back Crepe Dress - £44 – No wardrobe is complete without a show stopping going out dress, this little Topshop number is a brilliant option, the bold colour really pops and as the weather gets colder you can pop a long sleeved tee underneath for a super-cool nineties feel! 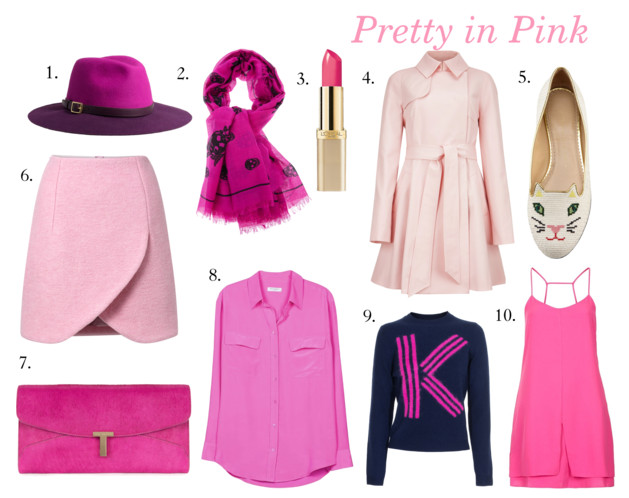 So what do you think of pink for winter? Will you be trying out the trend?